It was not easy to convince my pregnant wife to move to our new neighbourhood in Kafr Nabel in north western Syria. At the time, it was seen as the most likely area to be shelled by government forces, even though it had only been targeted once in the past. To convince my wife to live there, I had to conduct a military assessment of the area and give her a religious sermon. It had not been our choice to leave our previous, safer surroundings in favour of a more dangerous neighbourhood. But our landlord had returned from the refugee camps over the border in Turkey and moved into our house. Kafr Nabl has a population of about 30,000 and has been outside government control since August 2012. Before we moved into our new neighbourhood, I had to explain to my wife that the rebel positions from which shell attacks were launched had not been targeted for months. I explained that the militants stationed there were saving their ammunition for self-defence and were not looking to launch fresh attacks. I knew in my heart that she was not convinced, but she had no choice. Little by little, my wife grew used to our new neighbourhood and we were not subjected to any shelling by government forces. She was expecting our first child any day. Syrian army warplanes continued to circle the skies, but my wife was not scared of them as she did not believe that this neighbourhood would be bombed. There are no specific targets here and it is not close to any opposition stronghold. But to be on the safe side, she would hide under the stairs. 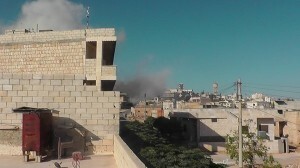 On the morning of September 24, the town of Hass, which is close by, came under fire from the sky. I heard it, and my wife went to her hiding place. I didn’t follow her because I didn’t think it was necessary. The next day, my wife woke me up and she was terrified. A plane was circling above the town and, judging from the sound, it was coming closer. We immediately took cover under the stairs. We could hear the plane coming closer. Then we heard the sound of shelling, but it did not come from the plane. Suddenly, we heard a loud explosion as something hit the neighbouring house and all of our windows shattered. My wife was terrified. I could not leave her and go to help the injured. When the attack was over, I looked into my wife’s eyes. I decided to take her to my parents’ house which was in a safer neighbourhood. When we got there on my motorcycle, my uncle and his whole family were there. They too had fled the airstrikes. I sat down with my uncle and my father to analyse the situation and try to understand why our neighbourhood had been targeted. Meanwhile, my mother prepared a whole chicken for lunch – a huge gesture as my parents are not wealthy. My father had bought it to feed all 15 of us who had gathered at their house. But my uncle and I weren’t hungry and we also both knew it would not be enough to feed everyone. Abdallah Kleido is a reporter in Syria.